Prosecutors accused Egypt's ousted president of leaking state secrets to Iran's Revolutionary Guards as part of a plot to destabilize Egypt. Prosecutors in Egypt on Sunday accused deposed president Mohammed Morsi of leaking state secrets to Iran's Revolutionary Guards as part of a plot to destabilize Egypt, AFP reported. The accusations came at the second hearing of the former Islamist president’s trial for espionage. The trial, one of three that are under way against Morsi, is part of a relentless government crackdown targeting him and his Muslim Brotherhood movement since his ouster by the army in July. 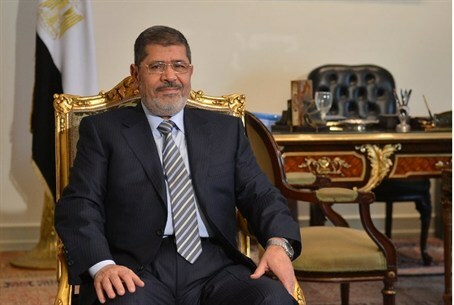 Prosecutors accuse Morsi and 35 others, including leaders of the Muslim Brotherhood, of conspiring with foreign powers, the Hamas terror group and Iran to destabilize Egypt. On Sunday, the second hearing since the trial opened on February 16, they detailed the charges against Morsi and his co-defendants. They were specifically accused of "delivering to a foreign country ... national defense secrets and providing the Iranian Revolutionary Guards with security reports in order to destabilize the security and stability of the country," according to AFP. The statement read in court did not identify the "foreign country", the report noted, but prosecutors said Morsi and the defendants carried out espionage activities on behalf of the "international Muslim Brotherhood organization and Hamas with an aim to perpetrate terror attacks in the country in order to spread chaos and topple the state" from 2005 to August 2013. During Morsi's one year presidency, ties flourished between Cairo and Hamas, the offshoot of the Muslim Brotherhood which rules neighboring Gaza. At Sunday's hearing Morsi was held separately in a soundproof glass cage, designed to keep him and the other defendants from interrupting the proceedings with outbursts. This, however, did not stop defendants, including Brotherhood supreme guide Mohammed Badie, his deputy Khairat al-Shater and other Islamist leaders from shouting and rejecting the accusations against them. The defendants were represented by a new team of 10 defense lawyers appointed by the lawyers' union, to replace the original team that withdrew from the case, noted AFP. The trial was adjourned to February 27. This trial is only the tip of the iceberg for Morsi, who faces a total of four trials against him. Two of his other trials have already begun: the first, which started in November, holds him responsible for killing protestors outside the Presidential Palace in 2012; the second, which began in January, cites his role in a 2011 jailbreak which saw the deaths of several police officers. A fourth trial will be held over charges of insulting the judiciary. This trial is seen as another step in Egypt’s crackdown not only on the Muslim Brotherhood but also on Hamas. While Morsi’s government was friendly with Hamas, the military-led government that ousted him has cracked down on the group, which it accuses of a December attack on Egyptian police headquarters, and planning church bombings in Sinai last Christmas. Last week, Egyptian border forces destroyed 10 tunnels and seven homes in the Sinai, as part of a new campaign to create a buffer zone along the border with Gaza that would extend 500 meters in some places.